Your Lapland adventure truly starts on the plane. The airline staff make it very special for the children from the minute they board the aircraft.There are games to play, songs to sing and shouting at the reindeer pulling the plane to get us there as quick as possible. The Captain also makes an appearance to hand out the prizes to the winners. The flights both ways were on time and the staff were very happy and helpful. We were lucky enough to stay in Santa's Christmas Log Cabin which was absolutely stunning and just how I imagined it would be. We pulled up outside to see the glowing lights in the windows reflecting on the snow outside. We were greeted by our Cabin Host,Sam, who had a fire roaring and a freshly baked chocolate Swiss roll ready for us to eat. The cabin was also beautifully decorated for Christmas. Sam was on-hand most of the time for anything we needed and was there to cook and clean for us during our stay. Included in the price is a three-course meal with wine on the first night, breakfast both days and, on the second day, we got back from our activities to homemade mince pies followed by our festive dinner and wine. The cabin we stayed in had five bedrooms with a toilet and sink in each, shared shower facilities,a sauna, a lounge and dining area. It was all very clean and very well looked after. Our cabin was also within walking distance of the town, where you will find shops, bars, restaurants and Europe's longest toboggan track if you fancy it. 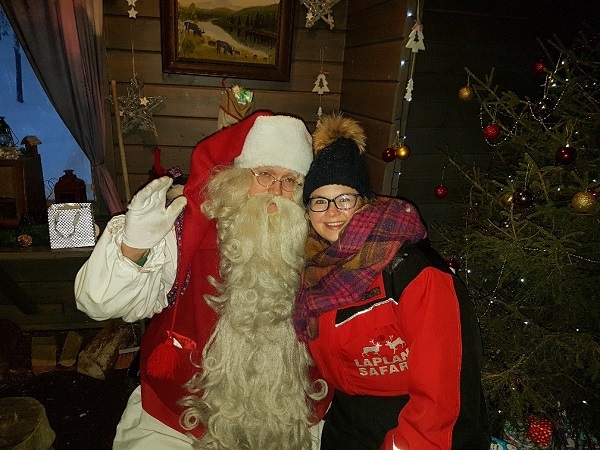 · Search for Santa Day at the Arctic Circle Centre - Here we had a whole day to enjoy activities such as husky sledding, a reindeer sleigh ride and a snowmobile sleigh ride through the forest in "Search of Santa". Lunch and hot drinks were also included throughout the day. There are many more activities to choose from too such as tobogganing, mini skidoos, ski hockey and tandem skis. There are also some optional excursions that you can add on. 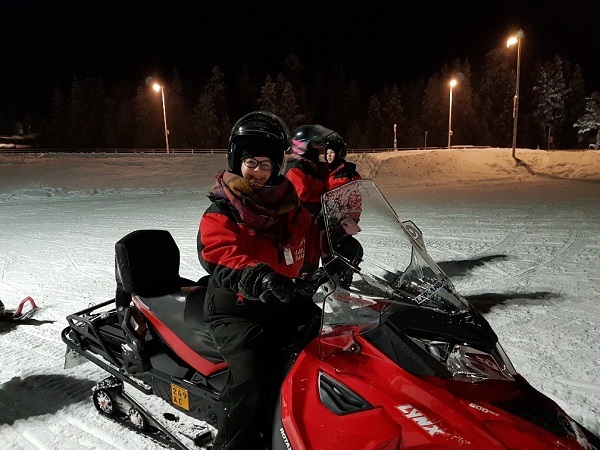 We added the Northern Lights Experience Snowmobile Safari which was amazing and well worth the addition cost. You can also visit reindeer and husky farms to meet the animals more on a one-to-one basis. I loved every minute of my trip to Lapland. As well as the magic of meeting Santa, I totally underestimated how beautiful the scenery and colourful skies would be. Plus, seeing the Northern Lights was a massive, added bonus! If you have the budget for it, I would highly recommend adding the Snowmobile Safari on. We left Saariselka at around 7.30pm and drove through the woodland up onto a fell.Whilst driving, the snow on the ground literally sparkled - nothing like I have ever seen before and so naturally beautiful. You have to see it to believe it! Once at our destination, we sat around the open fire sipping hot berry juice with gingerbread biscuits in the pitch black silent night and, take it from me, away from the fire you could hardly see your hand in front of your face. This meant it was the best conditions to see the Northern Lights! The excursion lasted around two and a half hours and, in my opinion, was well worth it. I would highly recommend this trip to my clients. It isn't a cheap holiday for a short amount of time but it is a once-in-a-lifetime experience, especially for children to visit Santa at Christmas time. 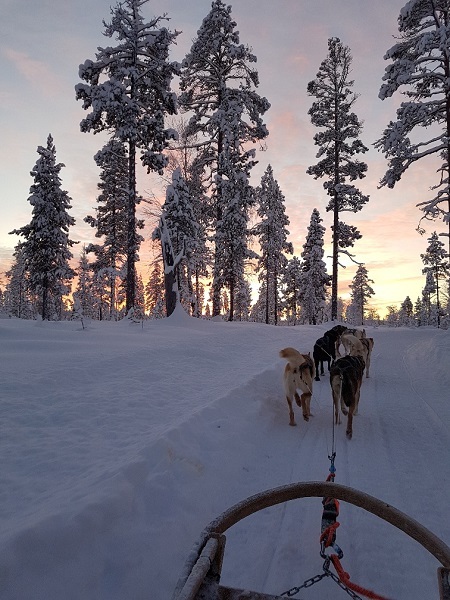 If you would like to book a holiday to Lapland for the family, we can help you plan your trip well in advance to help you get the best deal possible. Call us today or visit the team at your local branch – we have travel agents in Dorchester, Lymington, Bournemouth, Westbourne, Christchurch and around East Anglia.